The music from an old Brazilian CD wings me across the skies and back to the years we lived in the interior of the State of São Paulo. When I write “we” I refer to Doris and myself, our baby Monica and our son Vernon who was born there. What is the power of this music that takes me back to the fields of coffee? What is this music that transports me to where we raised of our children and did our work as missionaries? This music I hear is known as caipira music—the folk music of the people who have suffered and loved as they worked to make Brazil what it is today. The dictionary announces that caipira means hillbilly. But it is nothing of the sort for you’ll never hear an accordion, guitars and other instruments played with more skill anywhere in this world. The CD features a men’s duet with a tenor leading the smooth harmony. These ballads are often fashioned out of life’s heartaches and sung by the people in all of Brazil’s interior. The songs speak of life’s romances and heartaches, the experiences of many folks that we knew. Folk music best describe it. 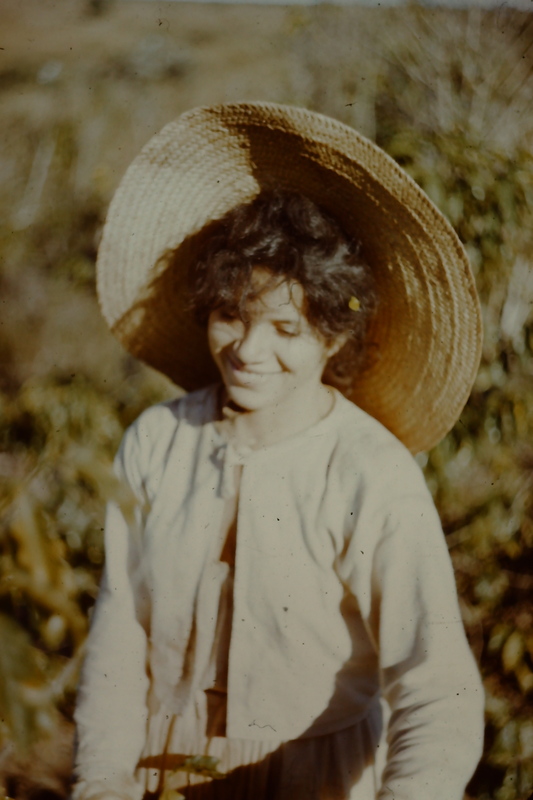 This young lady and family worked the coffee fields. 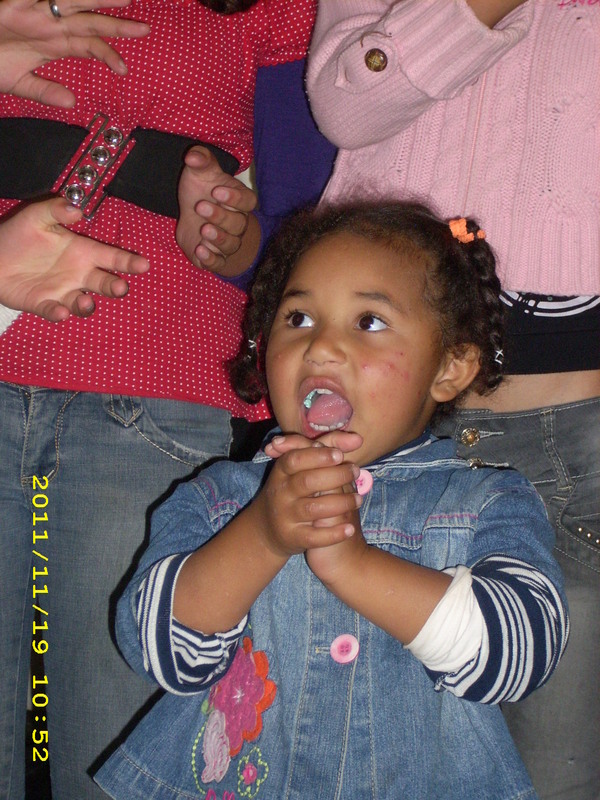 My, how the three sisters in this family could sing not only the “caipira” songs but the hymns of the church. So why does this move me so deeply? Just this—these are the people our family lived with and loved. As I listen I blink to keep the pieces of our past lives from speaking through my eyes. I see the maid that we trusted; she who took our blond baby girl across the fields to visit her family. I see Guilherme who owned a rice cleaning business and who after he gave his heart to Jesus wondered if he could stay in business without a little cheating. I see a couple from a coffee farm that with a large family lived in poverty. Since they wished to be baptized the folks from our small congregation raised the money for their civil wedding. 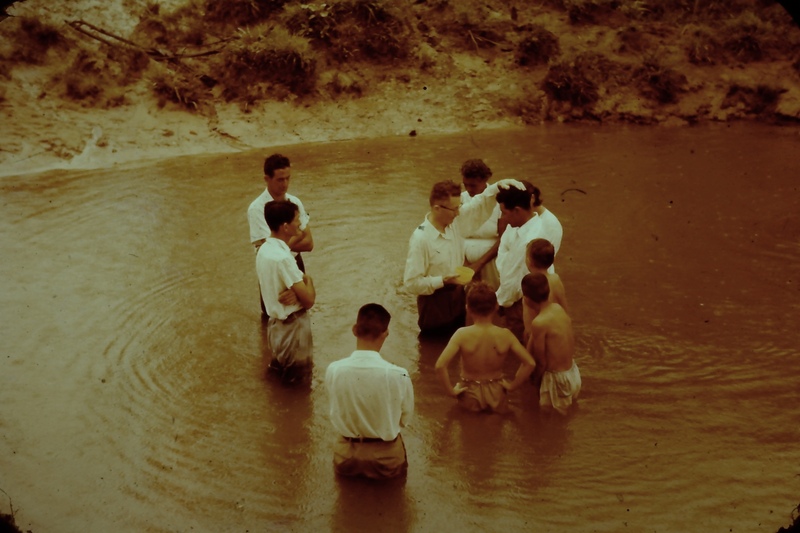 That document was necessary as a witness to their faith—a baptism in the stream, Barra Dourada that was not far from where we lived. A baptism with Rev. Campbell in the Barra Dourada stream. But the most pungent saudades, the nostalgia from those days are embedded deeply in a book, the Cantor Cristão. It is the little hymnal that we sang from in our congregations and from which our quartet sang. A quartet? It was made up of Rev. Murdo Campbel and Isabel with Doris and I. Those were times full of God’s grace. In my mind I hear the harmony of the music and the Gospel message embedded in those songs. Those songs built our own faith and those of the congregation. Some of those songs I cannot sing for they move me too deeply. Memories! 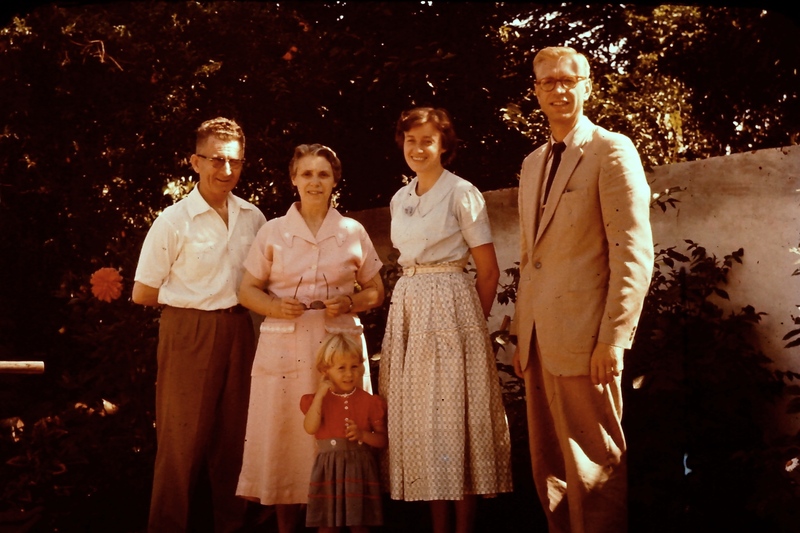 The Campbells were older than us and were in many ways like supportive parents. Our quartet: Murdo & Isabel, Doris and myself with Monica. On the inside of the cover of my Cantor Cristão are the numbers of hymns sung at different services but at the top is a note, “bells.” That meant that Doris played the cow bells for a service. On the back flyleaf is a note in Doris’ handwriting that no doubt she showed me during the service, “Visitors to sign the guest book at the door.” In Doris’ hymnal in her handwriting is a translation into Portuguese of “The Old Rugged Cross” and on another flyleaf “The Garden of Prayer.” And yet on another leaf in English this time are the words of the song, “Go ye into all the world.” Yes, we were there doing our best to obey the Lord’s command. What a wonderful comfort to us during our time in Brazil and as well it offers courage and strength to every follower of Jesus. Yes, it is offered now to you as you read this. This entry was posted in Uncategorized on October 30, 2017 by rkenny2014. Our parrot had the knack of being irritating especially just at daybreak. We could count on that happening every morning. Its perch was not far from our window so when it began to call, we could hardly get another moment of shuteye. It was a smart bird for it picked up some English without ever being given a lesson. The one word it loved in those early morning hours was what it had heard—that was ”Monica.” Now Monica is our daughter and that bird apparently heard us calling her for Monica felt free to roam the village of Neves. Monica is the word it would repeat just as the sun was chasing away the shadows. I wish I could tell you how loud and raucous it was—M-O-N-I-C-A—M-O-N-I-C-A and on and on. It was always wise to be careful how one petted the parrot. I say “our parrot.” Isn’t it something like that when parents buy a pet for their children? It starts out as their pet and becomes the parent’s pet. Anyway, this green parrot was quite similar to the 30 variants among the Brazilian parrots. Many of those parrots have heads or wings highlighted in red, yellow, blue in all sorts of variations but ours was a spectacular green. When we returned to Canada we left our parrot with a friend and sadly found out later a cat had the parrot’s bony frame for dinner. 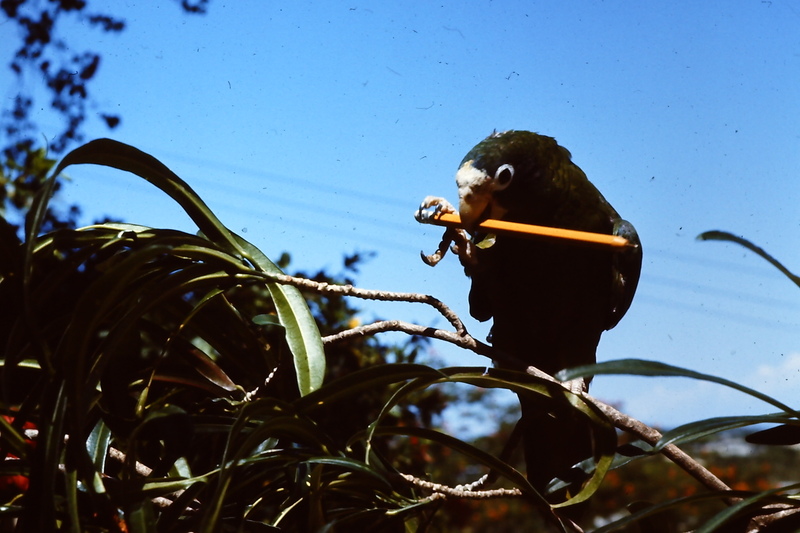 No matter our parrot’s failings, it was a good secretary. About the same time we picked up a little dog as a pet for Vernon. Doris said that every boy ought to have a dog; perhaps this one was given us for there seemed no lack of dogs around the village. We liked that little mutt—I’ll call it a mutt for it had no pedigree. Again it met an untimely death for it was run over in the street in front of our place. Doris says, “I was so provoked that someone killed our dog.” You see, all traffic was slow in Neves and about half that traffic was made up of horse drawn carts—so it made no sense that our little pet could get run over. But that is what happened. Then we had a pair of guinea pigs. 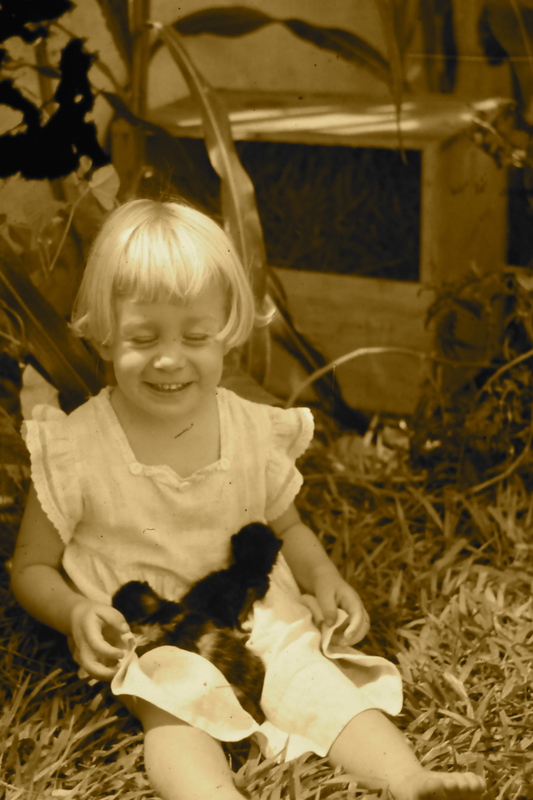 Our children liked them perhaps because they were easier to handle than the parrot or dog. Remember our children were about two and five. We kept the guinea pigs in a simple cage in our backyard. One day we found the female had given birth and those pequeninhos were in danger of perishing from the wet and cold. Yes, cold though that did not happen often in Neves. So the survival solution was to bring them in and warm them just a bit in the oven. Neither of us will take the blame; those poor little ones died but not of hypothermia. I don’t recall when we had a kitten, perhaps when the guinea pigs pass on to their rewards. 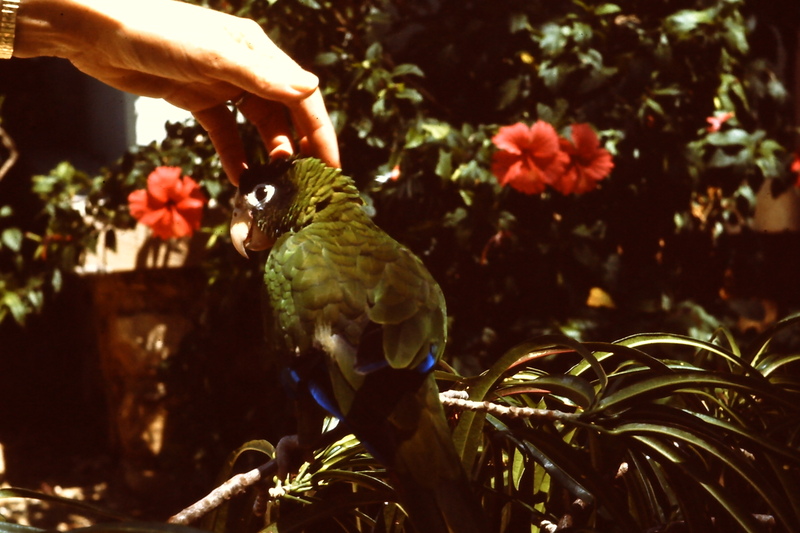 We also had a macaw—now some of our readers may say, “With your bad luck, it might be better not to have any pets. In any case our macaw never did talk as well as the parrot but its colors were remarkable with a bright blue back, wings and tail with a vibrant yellow/orange breast. White covered most of its jaw and head with fine black lines around its eyes. A green cap and a black tie finished off its colors. What a sight to see when it spread its four-foot wings. But I do not forget its large black beak. Yes I remember that beak for it could break a Brazil nut and it drew the blood a few times on my finger that got too close. I don’t recall when or where we purchased it but I do recall we had it in Rio. There a lady from across the road used to comment often about the beauty of our Macaw. The custom was then, that the person who commented a little too much about something was really asking for it as a gift. And that is what we did with our macaw—we gave it away. Since many Brazilian birds and animals are now protected and cannot be sold or exported, we’d not have a macaw if we now lived in Brazil. We had one other pet when we lived in Rio de Janeiro No matter what you think, we tried once again, this time buying a little Chihuahua pup. We ran across it—I’d better say that differently—we found it in the town of Mairipora and we really enjoyed the frisky little fellow. We gave him the name of “Yippy” and this is the reason. Yippy loved to be close to anyone of us and would often get under a person’s feet and then get his toes stepped on. Then he’d yip, yip, yip in his high little voice. Neighbour children made him ornery for they tossed stones at him when he was in our yard. When we left Brazil for the last time we gave him to another missionary family and though Yippy suffered a broken back in a run-in with a car, yet he recuperated and I recall he died a natural death. This entry was posted in Uncategorized on October 24, 2017 by rkenny2014. If it were not for a picture taken years ago and now in a scrapbook, I would not only have forgotten his name but the story that swirls around him. Here is José now–Doris had written down his name. It is so good to have a wife that is organized. José is looking over a small hymnal that we used in services. The rest of his name is lost but I’ll pass on the part of the story I remember. 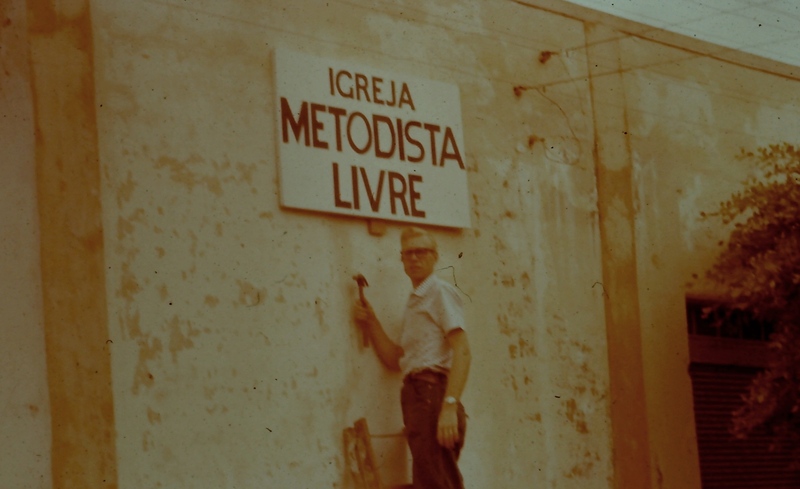 At that time we were living and working in the interior of the state of São Paulo; it seemed we were busy in four church planting projects and on the coffee estates. But in all of this José contacted us. He invited us to come to his town of Poloni and hold a service in his yard. So that is what we did. It was a big dirt yard with his home and a number of very simple homes both around it and close by. The yard was crowded with adults and children as we showed a film strip of the life of Christ. Those films strips were a great attraction for, if I remember, Poloni did not have electricity. A family who lived close to José that sent a message asking me to visit them. After clapping at the door of this poor home, The lady met me at the door of their poor home and explained that her husband was not yet home. So I waited till he came. You see it was improper to only visit with the lady of the home. When he pulled up with his donkey and two-wheeled cart he said he wished me to drop by to pray for his children with an eye infection. This family was plagued by a spirit that wished to control their home. But Jesus delivered them. Interest in the Gospel was strong enough in Poloni that we rented a small hall with Doris and me holding services there once a week. An interesting sidelight: the couple from whom we rented the hall had not spoken to each other for 20 years though they lived together in the same home. Doris would have a lesson geared to the children though the adults also loved to listen in. 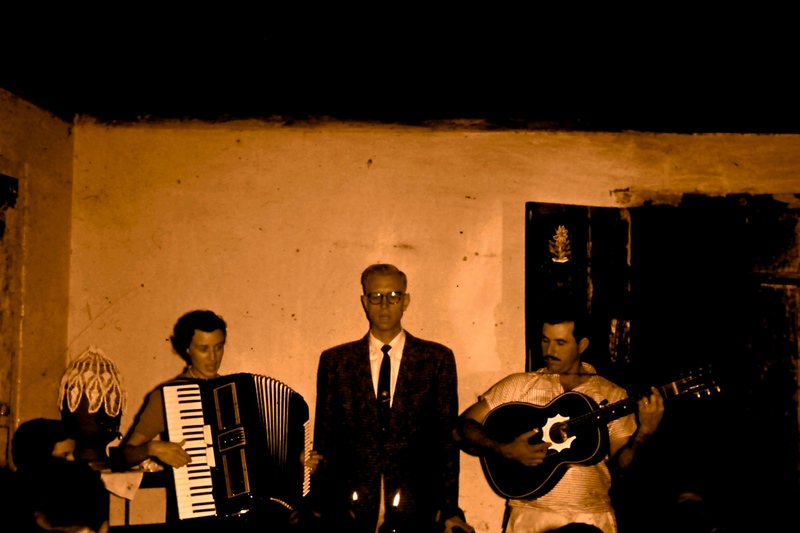 And of course Doris provided the music on her accordion while all I added was a short Gospel message. 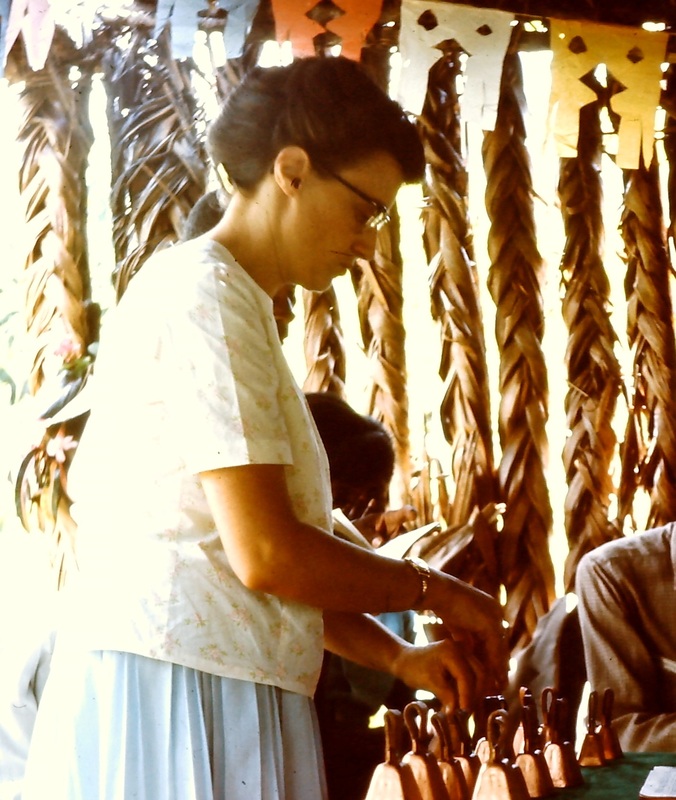 I said to Doris the other day that I would not have been much of a missionary without her. So true! Doris and her cowbells used in Poloni though this was taken elsewhere. One week we found we were in some trouble with the group that came to the services. We had thought that if we gave candy to the children that learned a Bible verse from week to week, it would encourage both memorization and attendance. It did the opposite for the complaint was that we discriminated unreasonably among the children. That was easily resolved. We were only in the interior a short while till we found out that using the bus system would not get us to the towns where we were planting churches—well, at least on time. And we’d certainly not be able to get out to the coffee ranches. 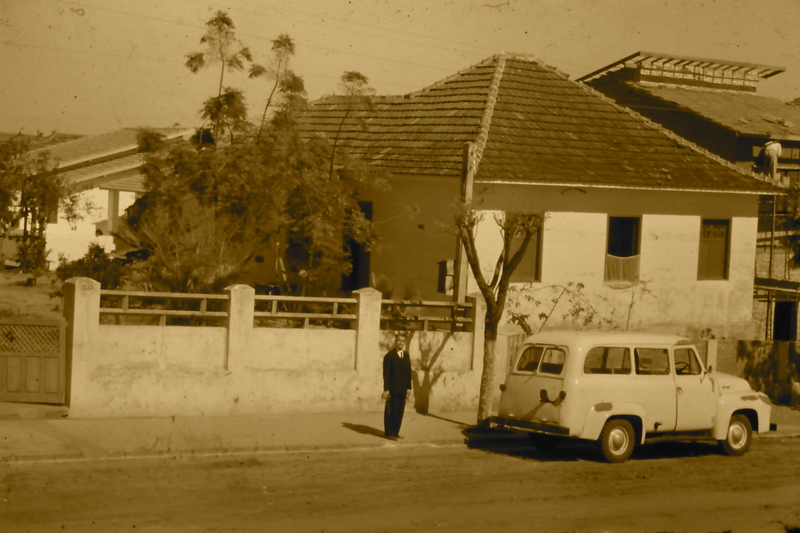 Well, we bought an old van, paid too much, fixed it up but it got us to where we wanted to go–to Poloni for example. We have other memories of wonderful people and places there in the interior. However we’ll leave that for another time. This entry was posted in Uncategorized on October 18, 2017 by rkenny2014. 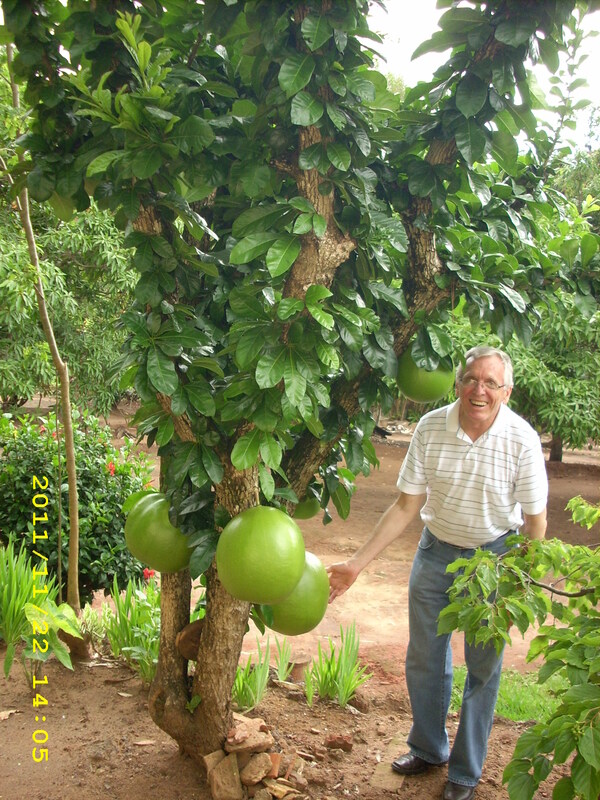 Nature is so delightful in Brazil since all the trees and flowers are radically different from here in Canada. We will only try to cover a fraction of what you as a tour member might see in the São Paulo area. We won’t try to touch on Brazil’s exotic animals. The gourds, cabaças, are especially useful. This type pictured has such a hard shell that it is cut and shaped to provide utensils for the kitchen and home. A great friend, Luiz Roberto da Silva is checking out these though there are others that are made into pretty doll’s heads and other pieces of art. Check it out on the internet. Shortly after arriving in Brazil I marvelled at the fallen flowers covering a sidewalk that were from a number of trees. 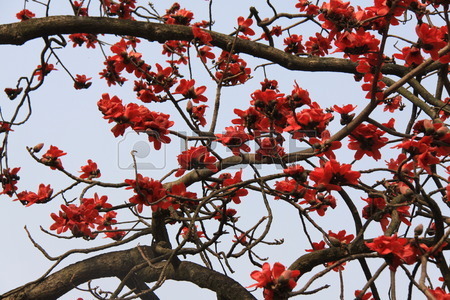 They were the kapok trees and after those flowers came a large pod full of a soft fluffy substance. For years it was used in life jackets till synthetic materials took over. Poinsettias are familiar to us for we buy them for Christmas decorations. In Canada the growing is refined to create small plants that do well in pots. 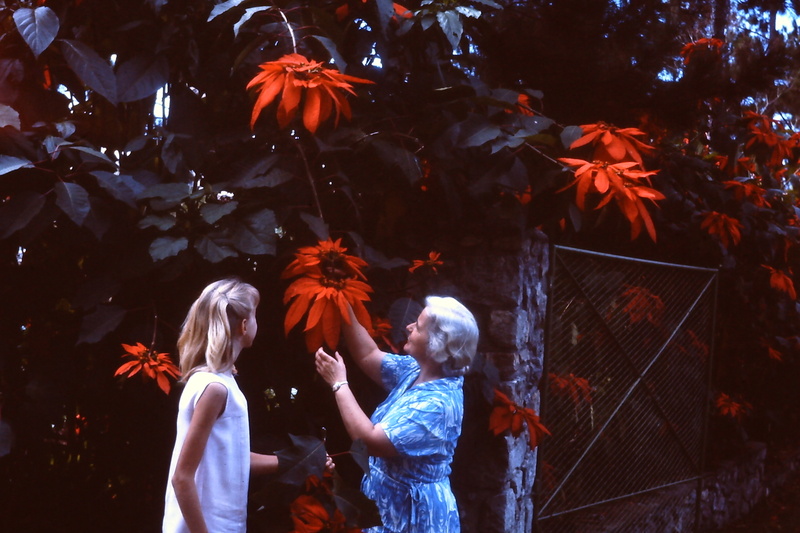 I recall the poinsettias all along the roadway to our rural seminary where the caretaker had broken off poinsettia branches and stuck them in the ground. 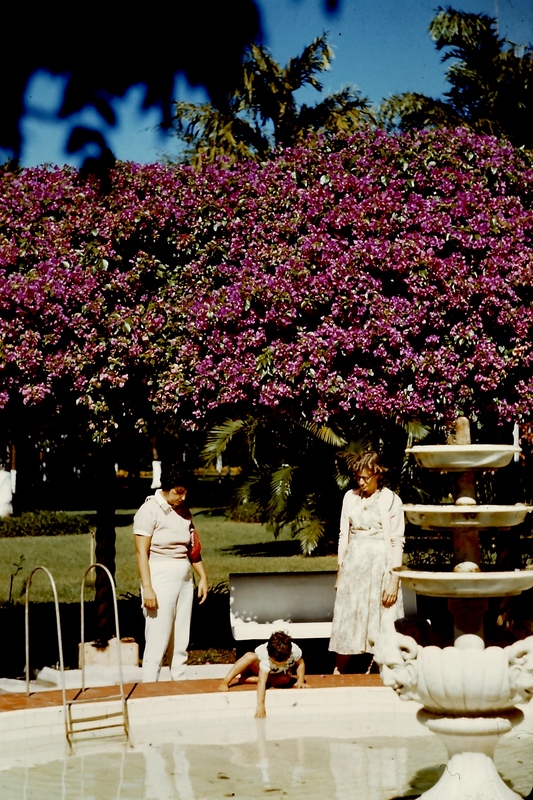 Note the flowers on this bush in front of our home at a later time, with Monica and Naomi Lindsay. Then of course I cannot forget the orchids in their wild variety and beauty. Maria and Alzenir took me to their backyard to show me their beauties that had been just slips tied to the trunk of a small tree. And I’ve also seen lovely orchids cultivated in the yard of the poorest of homes in the interior. And the bougainvillea bush showed itself so often as it covered the walls in front of many homes—that included the favelas for it grew so easily and was so pretty. I could go on and on with pictures of flowers of which I do not even remember names. Here are a few. 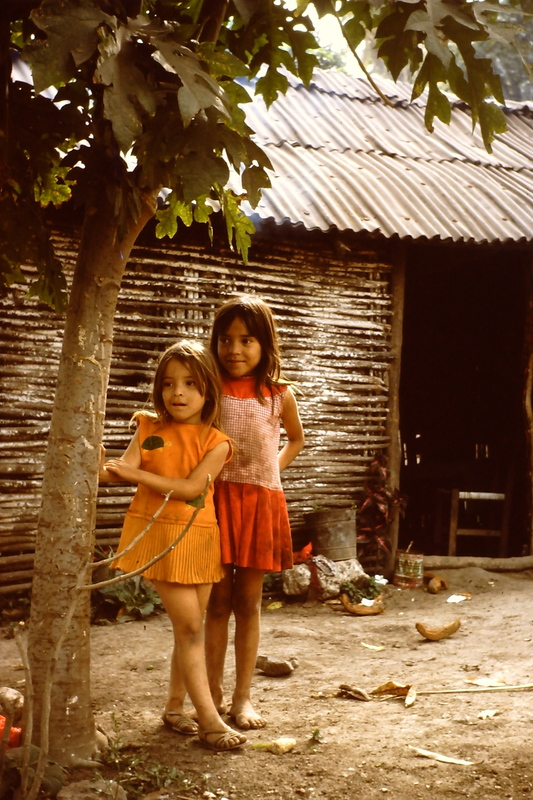 However the beauty of Brazil and any land are the people who live there—especially the children. Indeed the heavens and the firmament show God’s creative handiwork but it is the people of Brazil and our work among the children that have an eternal value. You see, God made us with a complexity and beauty beyond any flower, for he wanted and still wants us to dwell with him forever. St. John the apostle wrote down the words of Jesus so that “we might know that we have eternal life.” This is a beauty for all eternity. The flowers, the trees and each one of us pass on to begin another journey. We invite you to continue yours with Jesus as Lord and Saviour. This entry was posted in Uncategorized on October 10, 2017 by rkenny2014. Doris—my capable wife, is a graduate nurse and with her Bible School background in Christian Education she was equipped for her work in Brazil. You’ll see the importance of the nursing part as I tell of some, just some of our family’s excursions into illnesses and accidents. You may imagine we needed two fulltime nurses especially for our son Vernon who seemed to be the target of so many difficult incidents. Monica was just as sick but the pox don’t show in this picture. 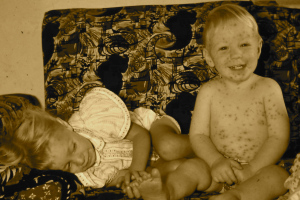 One of the saddest pictures I’ve ever taken was of our two children sitting on our couch in the city of Rio Preto—sad because they both had chicken pox. They had pox in their hair, over all their bodies and even on the bottom of their feet. Years later those pox scars showed on Monica’s face and I have no doubt they are still there. Doris was the only one that could make them as comfortable as possible —she was mom as well as a nurse. Soon I came down with the same bug. All that I recall about the chicken pox is that I was so sick. Yes, I too needed that nurse. Less than a year later we moved to the dusty village of Neves that was surrounded by coffee farms. 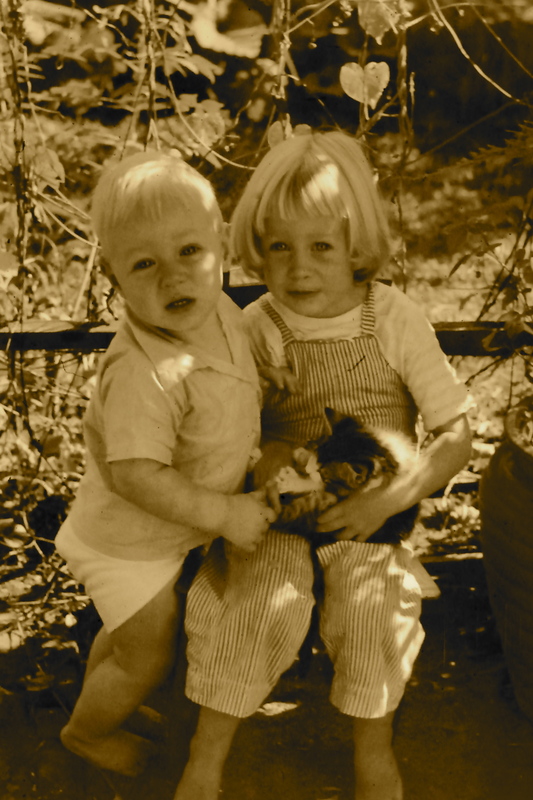 Vernon was not yet two years old when Doris discovered one evening that he had a very sore arm. She was giving him his bath and he complained when she touched it. We were so fortunate to have a doctor in the village—so off we went. He declared that Vernon had a fracture. Vernon was a year older of so when he had the green stick fracture. This is how it happened–at least that is our guess. The only thing from which a little boy might fall in our yard would be the low wall between our home and the street. No doubt that wall was mountain climbing to Vernon–in any case he ended up with what is called a “green stick” break. No cast was necessary but Doris kept it bandaged to make it more comfortable. Another broken arm happened when we lived in Rio de Janeiro—that time the break gave him another elbow. We have written that story up in detail in another posting. The hepatitis Vernon picked up in Rio was of course more serious than a broken arm. We lived in a nice home and paid little attention to the dirty creek that ran behind our lot. We had warned our Vernon not to go near it but that was difficult to do when other boys would gather minnows from it in bottles or cans. Nothing worked to keep him away from the creek. 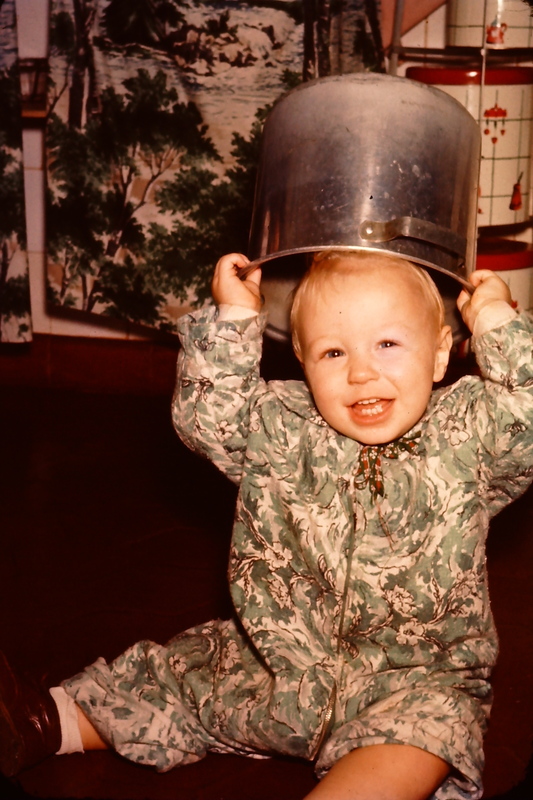 When other boys played there—his inner logic would be, “If they can, then I can too.” The water there was especially dangerous for some of it came from a local hospital—with the result that Vernon picked up hepatitis A.
while in Rio, Vernon graduated from kindergarten. Now the part about God’s angels taking charge. 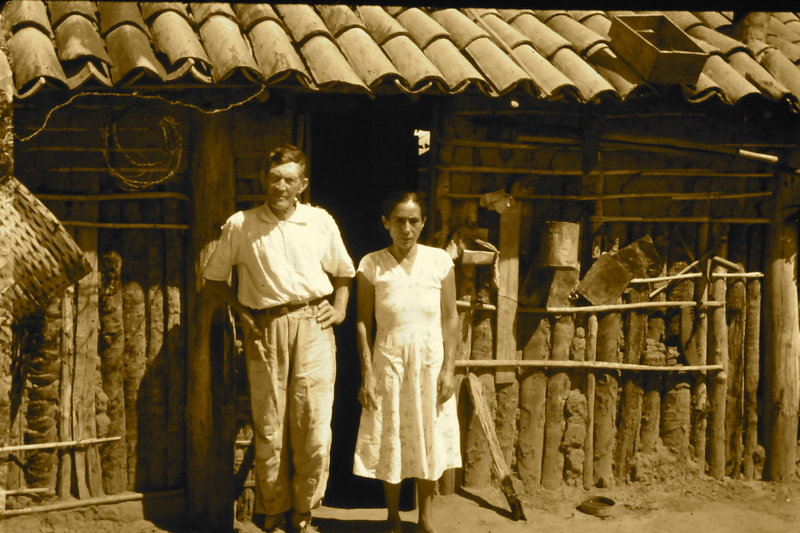 The doctor we contacted had worked among the indigenous Brazilian Indians during an epidemic of hepatitis and with his experience he knew to prescribe an antibiotic that within weeks solved the sickness. I believe his help was an act of Divine care for without proper treatment hepatitis may leave severe liver damage. But it was not long before Doris picked up the hepatitis bug from Vernon. So the two of them were in bed with severely restricted activities. That was tough for an active young lad. During that time I was the nurse–does that make you smile? It should, though I did my very best. It was there in Rio that a young lady came to our home looking for work as a maid. Since we had been in Rio only a short time, had no maid yet and being of a trusting mind we hired her. For a while we thought everything was going well till our children told us they were being mistreated when we were both absent. We learned that Vernon would sit on the top step of the stairs in our two story home anxiously waiting for us to return. That picture even now in my mind brings me to the verge of tears. At the same time we found the maid was stealing from us. She had to go. 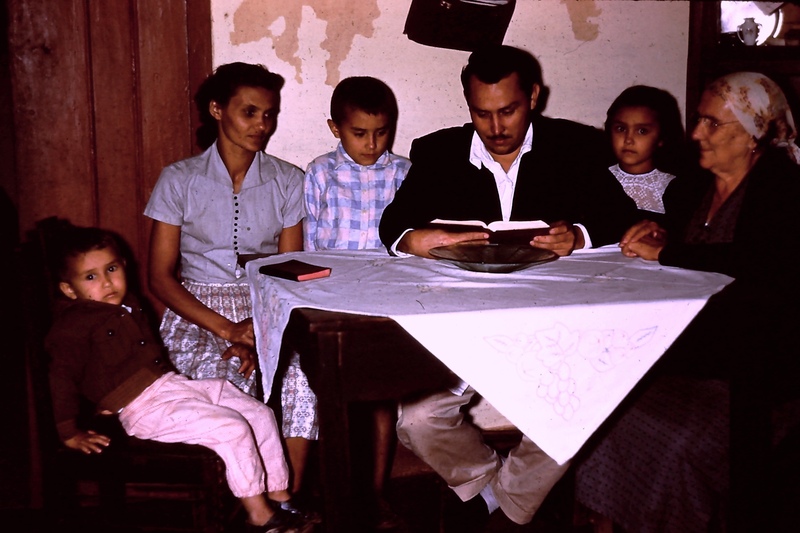 In spite of living in the interior and in spite of sicknesses, our children were quite normal. There are good things that come to moms and nurses to make life easier and balance out the hard times. I call it Divine providence. While we lived in Rio both of our children enrolled in a private school run by a wonderful Baptist family. It was a delightful experience for them for the language of the school was the same as that of our children–Portuguese. I have pictures of Monica and Vernon dressed up for graduation decked out in robes and mortar boards. 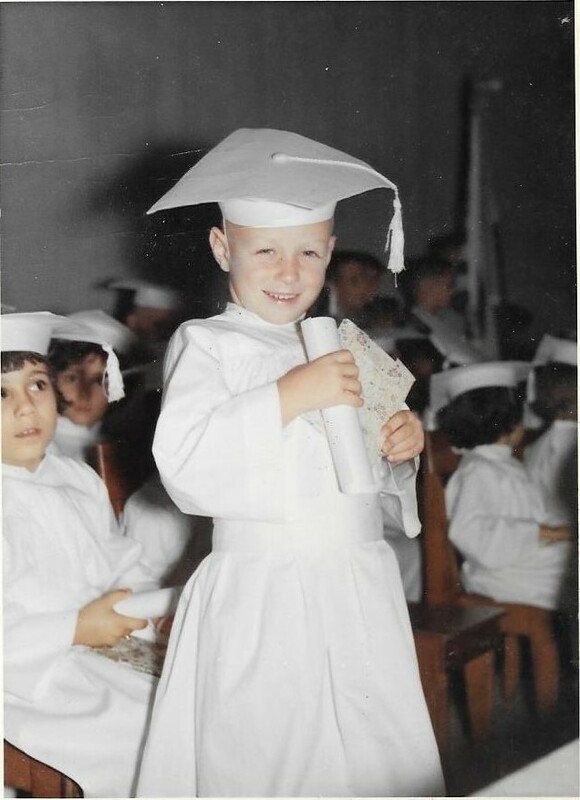 Just imagine–Vernon’s graduation was from Pre-Kindergarten and Monica from grade one. We are still friends with Noemi, one of their teachers. 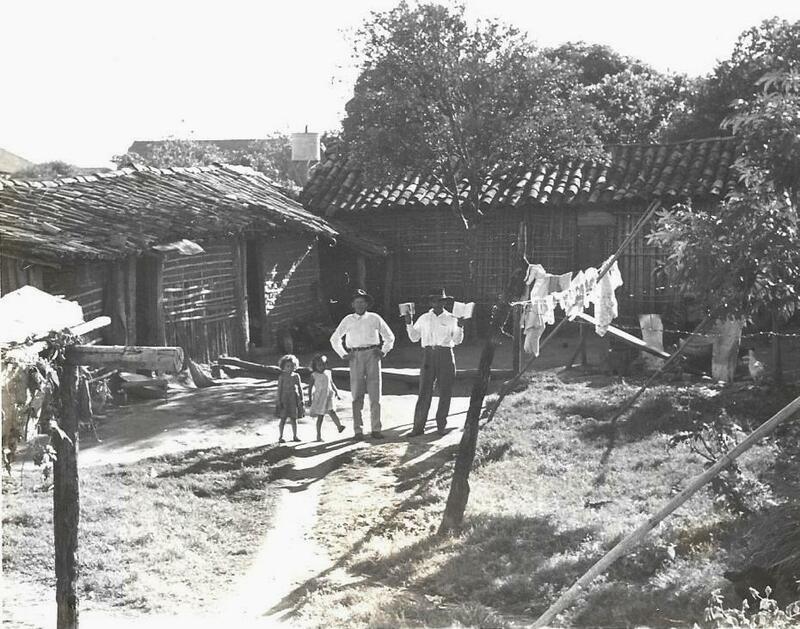 It is unfortunate for our children that our family soon moved away from Rio to São Paulo. That is another story, a difficult one that I may not write about–ever. This entry was posted in Uncategorized on October 3, 2017 by rkenny2014.